Raghu is decorating pillar on ladder. He waits for Dhanak. Dhanak comes there. Raghu says are you really here? Dhanak says I am sorry. Raghu is stunned. Dhanak says I was wrong this time. Raghu says no, I did it wrong way, he is about to fall down but Dhanak pulls him closer. Raghu smiles at her. Dhanak says thank you for saving my sister’s life. Raghu says no tension. She laughs and says goodnight. She get down from ladder and leaves. Raghu says I will come in her dream, she will come to me soon. Raghu comes to house and dances around Mai, he says my time will come, your daughter in law is coming soon. Mai says I am ready to welcome her, she will come? Raghu says she will, I will pacify her, tomorrow is Mahashivratri, I will try to talk to her. Mai thinks he is a fool. In morning, Nani is talking in pooja. Raghu comes there and calls Dhanak. He says you said sorry, I wanted to say something, welcome, I want to welcome you in my house, you understand? I want to do your garhparvesh and its a good event to do it, please say yes. Dhanak says you stop dreaming in daylight. Raghu says please fulfill this dream of mine. He says I am soft from inside, you will love me soon, take your time. He leaves. Sejal hears all that. Dhanak goes in house. Nani says we should forgive people and trust people’s best qualities. Dhanak and Sejal looks on. All leave. Sejal says to Dhanak that forgive and accept Raghu, he loves you a lot and can do anything for you, I keep trying to find someone to love me. Dhanak says he is a goon. Sejal says but he saved your sister’s life, he saved our father’s life too, you dont want to see his good qualities. Dhanak is running on track and recalls everything related to Raghu. She recalls Sejal’s words too. Pooja starts in chawl. Raghu goes and stands with Dhanak but she leaves. Mai comes there for pooja and says its our event, give things to Mahadev. Natak will happen too. Raghu thinks that Dhanak is thinking about me. Mai thinks that I will earn a lot today. Mai goes to mandir. Priests stands outside. Dhanak sees Maya taking out things from mandir from backside. She comes outside mandir and asks what is going on? Priest says Mai is putting jewelry on Shiv. She opens mandir and asks Mai what is going on? Mai says I am dressing him. Dhanak sees some sacks there and brings them out, she says to people that see Mai was taking out sacks from mandir, I dont know whats inside. She asks Mai. PRECAP- Dhanak says to Raghu I will enter your house but I need something in return. He says just ask me, I will give you anything. Dhanak says I want your Mai out of your house, as I enter, she leaves the house. Raghu glares at her. 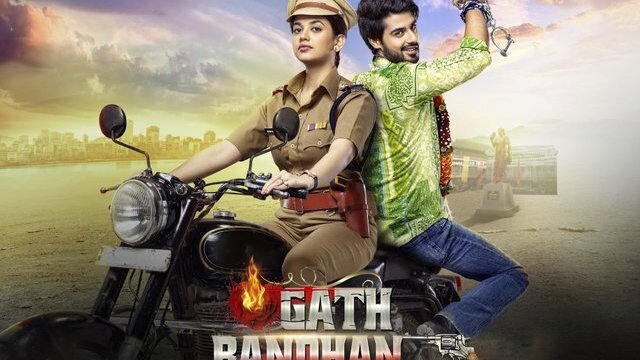 The post Gathbandhan 6th March 2019 Written Episode Update: Dhanak considers Raghu’s offer appeared first on Telly Updates.